6 premium author's custom Lightroom & Camera RAW presets. They were created based on actual artwork from the portfolio. Perfect for fine art photography and those who like to experiment with color. 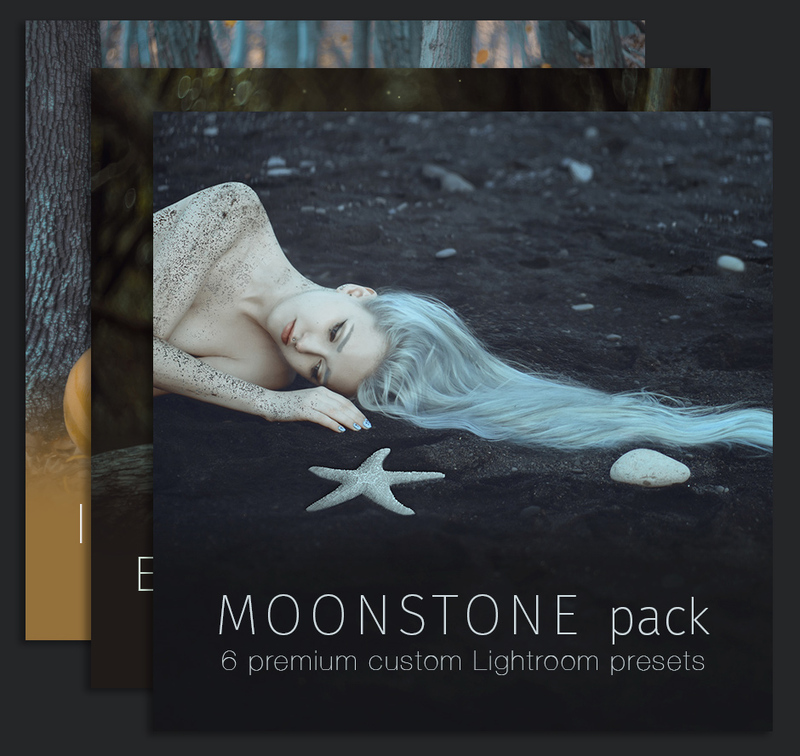 Moonstone pack presets give author's signature cold tones to the image. Delicate muted blue colors will help achieve dreamy effect, cool hues of highlights create those soft porcelain skin tones and all these shades of blue work their magic on whimsical atmosphere of your photographs. Enchanted Forest pack presets give earthy muted colors to your photographs. This pack provides soft contrast and washed out tones. Some of the presets add a nice teal&orange color scheme. Perfect for portraits in the green scenery such as forest, park or just trees. Make dryads and forest fairies come to life with the Enchanted Forest presets pack! 6 premium custom author's Lightroom & Camera RAW presets. They were created based on actual artwork from the portfolio. Perfect for fine art photography and those who like to experiment with color. Indian Summer pack presets provide photos with soft warm tones, contrast, stronger vibrant colors and desaturated greens. This pack adds a smooth yellow and blue color scheme to the image. Perfect for last warm and crispy autumn day feeling. All 18 premium custom author's Lightroom presets in one bundle for a reduced price. You don't have to compromise and pick and choose anymore! Sign up to receive news, updates, freebies, special offers and to get a FREE pack of my 3 favorite Lightroom presets! I respect your time and privacy. I promise not to email you often and only provide relevant information for your benefit and interest.